Announcement Vintage Style handmade jewelry including engagement rings, wedding bands, and promise rings in sterling silver and yellow and white 14kt gold. 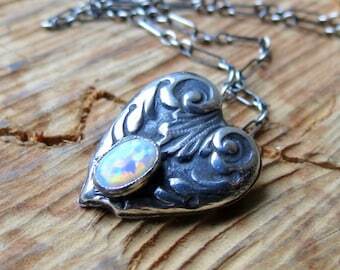 Artisan crafted sterling silver jewelry with gemstones and vintage gems. Buy with confidence from the original. Each piece of jewelry is made start to finish by me in my studio by my hand using traditional goldsmithing fabrication techniques. Custom orders available. 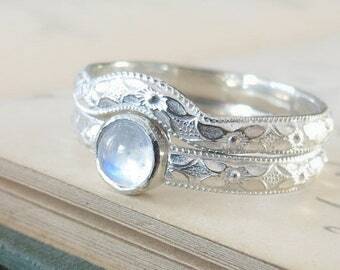 Vintage Style handmade jewelry including engagement rings, wedding bands, and promise rings in sterling silver and yellow and white 14kt gold. 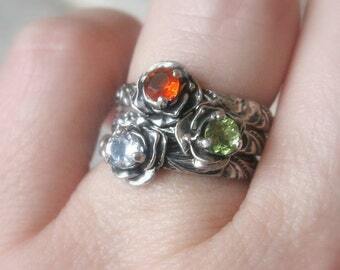 Artisan crafted sterling silver jewelry with gemstones and vintage gems. New gold over sterling leaf ear climbers in the shop. Handmade in my studio. The long leaf ear climbers are finally back! 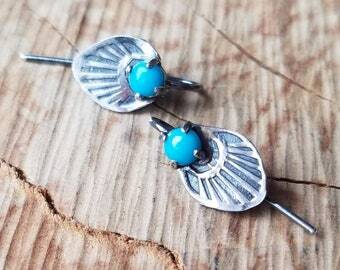 Perfect summer earrings! New one of a kind branch rings, moonstone and amethyst. 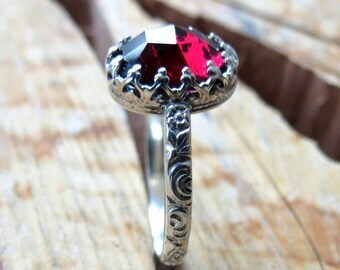 Unique statement rings make unique gifts. Lasso the moon and put in on her finger. 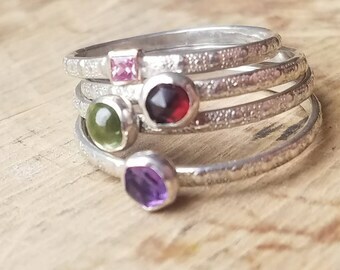 I am a maker of handmade wedding rings and sets,alternative engagement rings, promise rings, commitment rings, and gemstone jewelry. As I child I spent lots of time at Art Fairs, I was in awe of the talent and the beauty but could never afford to bring any of it home. I always thought artists were a special breed of people that were born with some special talent that sprouted forth whole. I started this journey as a potter for a hobby. 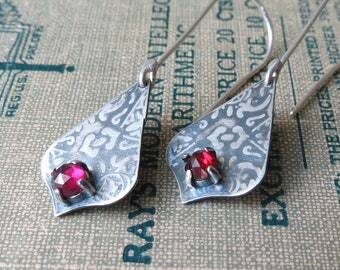 Clay led to metal clay and when I found that limiting I took a metalsmithing class and then I fell in love. you see, I always thought I would be a collector and not a maker but once you find the medium that speaks to you the need to be a maker is overwhelming. When I first started working in metal I felt instantly at home. I feel very lucky to be able to fill my days doing something I love to do & I hope it shows in my work. We are all artists and we all can develop that talent that is born within all of us. It is important to me to make things that are affordable and beautiful so that everyone can bring a piece home. Everyone deserves beauty in their lives, especially little dreamer girls wandering art fairs. 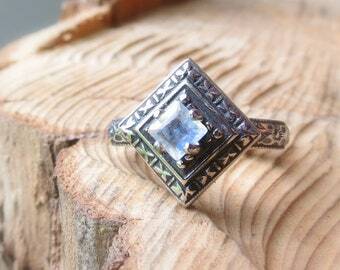 I want to be certain that you my valued customers know that the jewelry I make is handmade by my hands. I use two methods to create my jewelry. One is a traditional metalsmithing - such as sawing, soldering, forming, using hand tools such as saws, hammers, and mandrels.etc. 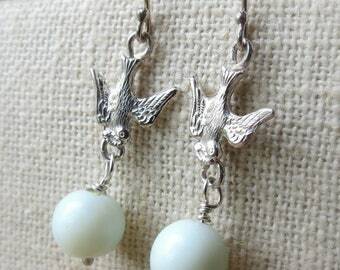 The other way I create jewelry is the lost wax casting method. This method starts with a piece of wax I have shaped with my hands into the form, or sometimes an organic piece such as a pod or branch. These pieces are invested in a plaster type substance and are burned away (ie the "lost" part of the name) and molten metal is shot into the cavity that is created, I use a centrifugal caster to be specific. Please feel sure that these pieces are created one at a time, with love and care, by my and only my hands. Etsy has decided to allow manufactured items on this platform please be certain of what you are buying if you are looking for a handmade item and be sure you are getting full disclosure from the seller you choose. 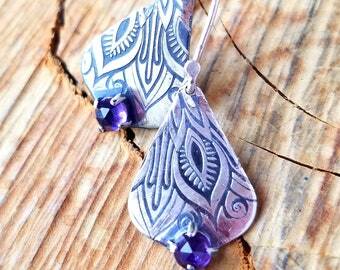 I am artist working alone in my studio, creating beautiful pieces of jewelry by hand using traditional smithing methods. I started this journey as a potter an found metal through the Boca Raton Museum School of Art. 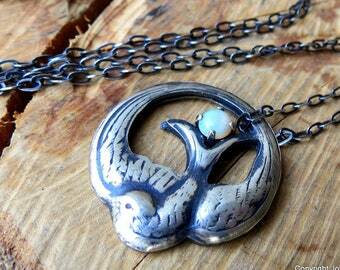 With the new Etsy Guidelines, launched in Sept 2013, Etsy is allowing manufactured items in the handmade category. This shop only contains things made by my hands. No commercial rings/jewelry that I have set gemstones into. Thanks for your support! 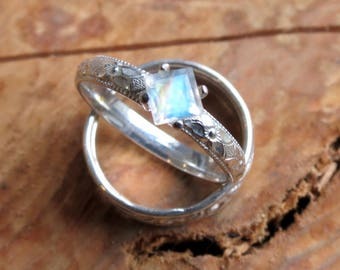 I am a maker of handmade artisan crafted wedding rings and sets, gemstone alternative engagement rings, promise rings, commitment rings, and gemstone jewelry.Thanks for looking in my shop! Please be sure to read and understand my policies before you purchase. If you have questions, I am happy to answer them and open to help make buying here a wonderful experience. Each artist pours heart and soul into creating new and exciting pieces for our customers. Those designs are like our children whom we nurture and send out into the world to find new homes. Please respect this, act with integrity, and do not copy. Instead make your own pieces, with your unique voice to find your own success. I wish you the joy of creation. You items will arrive artfully wrapped and in lovely boxes ready for gift giving. Packaging consists of recycled materials that are commercially recycled and clean. I use jewelry boxes made of recycled paper. 100% recycled cardboard box (made with 100% post-consumer fiber) is covered with FSC-certified recycled paper made from 30% post-consumer fiber. The Forest Stewardship Council (FSC) certifies that this paper is manufactured using ecologically responsible processes—in this case, elemental chlorine-free (EFC) pulp or wind power. I try my best to be green when possible! 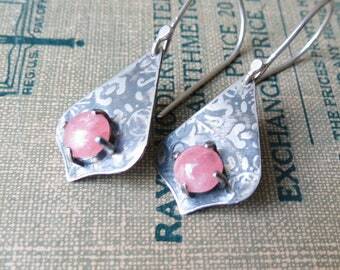 A large percent of the silver used in my shop is commercially recycled silver. 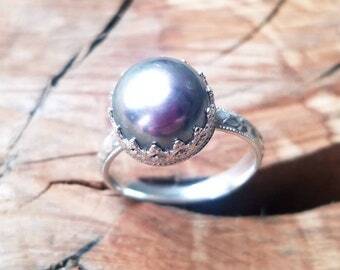 Recycled silver puts less of a strain on the planet as there is less mining. I am also bringing in more lab created stones as an alternative for those ecologically conscious about mining for gemstones. There are many colors and shapes of beautiful lab created stones, please contact me if you are looking for something you don't see in my shop.